An anthropologist on Mars : seven paradoxical tales / Oliver Sacks. Edition: 1st ed.Material type: Book; Format: print ; Literary form: Not fiction Publisher: New York : Knopf, 1995Availability: Items available for loan: Butte Public Library [Call number: 616.8 SAC] (1). Uncle Tungsten : memories of a chemical boyhood / Oliver Sacks. Edition: 1st ed.Material type: Book; Format: print ; Nature of contents: ; Literary form: Not fiction Publisher: New York : Alfred A. Knopf, 2001Availability: Items available for loan: Butte Public Library [Call number: 616.8 SAC] (1). Oaxaca journal / Oliver Sacks. Material type: Book; Format: print ; Nature of contents: ; Literary form: Not fiction Publisher: Washington, D.C. : National Geographic, c2002Online access: Publisher description Availability: Items available for loan: Butte Public Library [Call number: 587 SAC] (1). The man who mistook his wife for a hat and other clinical tales / Oliver Sacks. Edition: 1st Perennial Library ed.Material type: Book; Format: print ; Literary form: Not fiction Publisher: New York : Perennial Library, 1987, c1985Availability: Items available for loan: Butte Public Library [Call number: 616.8 SAC] (1). Musicophilia : tales of music and the brain / Oliver Sacks. Edition: 1st ed.Material type: Book; Format: print ; Nature of contents: ; Literary form: Not fiction Publisher: New York : Alfred A. Knopf, 2007Online access: Table of contents only | Contributor biographical information | Publisher description | Sample text Availability: Items available for loan: Butte Public Library [Call number: 781.11 SAC] (1). The mind's eye [electronic resource] / Oliver Sacks. Musicophilia [electronic resource] : tales of music and the brain / Oliver Sacks. Oaxaca journal [electronic resource] / Oliver Sacks. Musicophilia [electronic resource] : and other tales of music and the brain / Oliver Sacks. by Sacks, Oliver W | Lee, John. Edition: 1st American ed.Material type: Book; Format: print ; Literary form: Not fiction Publisher: New York : Alfred A. Knopf, 2012Availability: Items available for loan: Butte Public Library [Call number: 616.89 SAC] (1). Hallucinations [electronic resource] / Oliver Sacks. 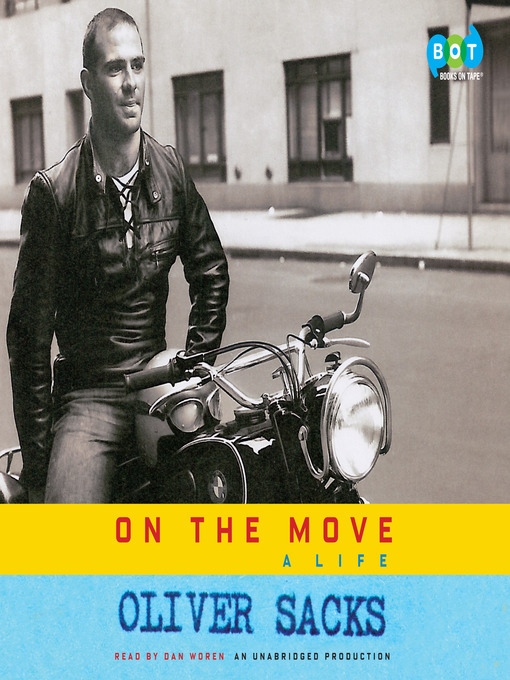 On the move : [a life] / Oliver Sacks. by Sacks, Oliver W [author.] | Woren, Dan [narrator. ].